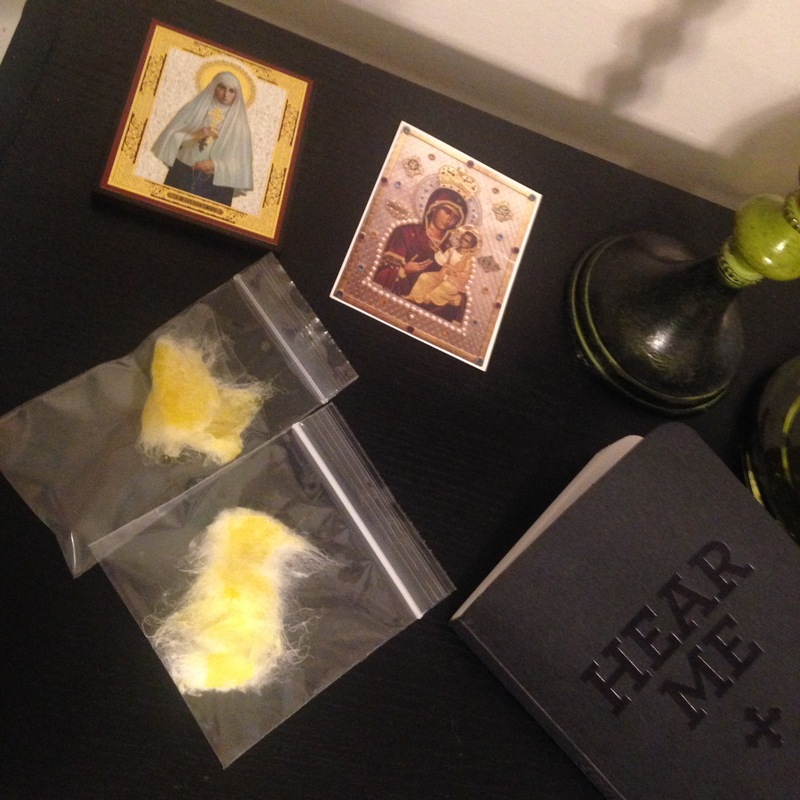 I don’t know what to do with two small zip-lock baggies of myrrh that my wife and I collected last Sunday (June 5, 2016) from a miraculous myrrh-streaming icon of the Theotokos in Taylor, PA. These two swabs of white cotton soaked in a bright yellow-orange oil are shut up tightly inside plastic, but they still give off a pungent, sweet fragrance that definitely includes rose blossom (along with other scents that are less easily discerned, such as two that my children suggested: “honey comb” and “new doll”). One story told by Father Mark touched Father Peter in particular. It was about a teenage girl who struggled with a horribly negative self-image and who faced harsh bullying at school. When anointed by myrrh from the icon, she was delivered from thoughts of self harm and became a strong and confident young lady who was filled with thanksgiving for God, her family, and her friends. Father Peter also relayed how God clearly did not discriminate between various types of believers when it came to granting mercy through this icon. Those healed included Christians from many traditions as well as Muslims and others. Father Peter had seen many other myrrh streaming icons over his decades of ministry, but this experience had clearly moved him in a fresh way. While he spoke, I was thinking of my mother who was diagnosed over a year ago with stage four breast cancer that doctors said could never be eradicated by medical means. My eight year old son was evidently thinking of my mother as well. He leaned over to me and whispered, “We should take grandma to see this icon.” After the service, he and I joined the line of those going forward to be anointed with the sweet-smelling oil collected from this icon. As I said, that was March 20, and it was June 5 before we made it there with my mother. 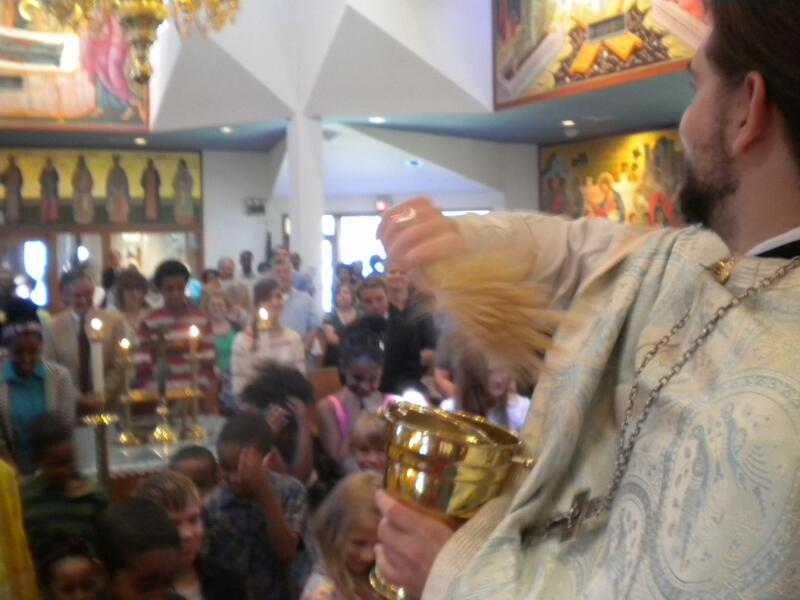 Our visit to St. George’s Orthodox Church in Taylor, PA was rescheduled twice. Then, on the morning of the visit, it was difficult to get up on time, to pack up and clean the house where we were staying for the weekend as an extended family, and to keep our cool while following GPS directions that took us via an extremely strange and circuitous route. (Truth be told, I did not fully keep my cool during this last leg of the road trip.) We made it to the Sunday morning service (called the Divine Liturgy) about half way through (near the end of the sermon), and my extended family followed me quietly into seats within the first two rows of pews on the far right side of the sanctuary. We did our best to pray and sing our way through the remainder of the highly elaborate and largely unfamiliar service. Visiting along with my mother and I that morning, there were also my wife and two children, my father, my young twin sisters (the same age as my daughter), and two of my grown siblings, a brother and a sister (a mother of five) who had her baby boy along with us. At the end of the service, Father Mark had a lengthy announcement about the proposed purchase of a walk-in freezer for the congregation as well as comments about a recent chemical analysis of the myrrh from the streaming icon (an analysis by a Ukrainian association of chemists that had not been sanctioned by the bishop but that had produced some fascinating results that Father Mark detailed quickly to his congregation). He finally concluded the service by inviting anyone to come forward and to receive an anointing with myrrh from the icon. Every member of my family and extended family came forward, and a visiting priest gave the blessing and the anointing, placing a small dab of myrrh in the sign of the cross on each of our foreheads with his thumb. As we were all going up front for this, my wife checked that all of our family members had noticed the location of the streaming icon near the center of the sanctuary. Its entire surface was visibly wet with myrrh, and some oil could be seen on the outside of the icon’s protective case. My mother needed to use the restroom after this, and I hung out near the sanctuary hoping to catch a word with Father Mark, who I had corresponded with several times over the past few weeks in preparation for this visit. He was busy with a portion of his congregation offering a prayer service for a recently departed member of their church. I checked on my family situated in the social hall attached to the church and returned to the sanctuary, where I waited and finally had an opportunity to greet Father Mark. He was praying with a devout and emotional young couple who were clearly also there to seek help from Mary at her myrrh-streaming icon. Father Mark was also busy with some of his deacons and several remaining members of the congregation, lifting the protective cover from the icon and examining the cotton swabs packed into a tray along the icon’s bottom edge to collect the myrrh. He and several others were expressing joy at the quantity of myrrh as it dripped from the protective case itself, and one woman reached out to catch the drops before they fell to the floor. With some persistence, I was able to get Father Mark’s direct attention and introduce myself. He seemed to vaguely remember corresponding with me, and then he warmly welcomed my entire family and extended family. He asked each person to hold out their hands as he held up the icon and waited for one drop of myrrh to fall into the hands of my father, mother, four siblings, wife, son, and finally my little nephew. My daughter quietly declined. 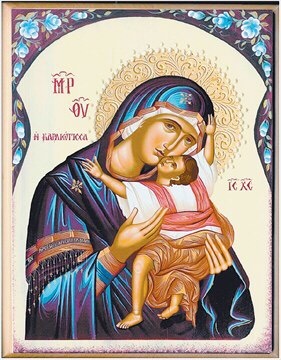 During this time, as the drops fell one-by-one into outstretched hands, two older women from the congregation were alternately praying out loud and chattering with members of my family (telling them many stories about the icon). Father Mark invited us to leave any written prayer requests in little decorated blue boxes at the back of the church. These requests would be read out loud in the sanctuary and placed into a large wooded chest that was kept near the icon. One of the elder ladies explained that a member of the congregation had given this chest to the church for this purpose and let us know that hey had another chest stored within their altar area that was already filled with paper slips holding prayers from previous visitors. In one last effort, I asked Father Mark if he would pray specifically for my mother right then and there. He agreed and prayed for her out loud before the Mother of God’s myrrh-streaming icon. Father Mark was a generous and unassuming man who radiated simple joy and good humor. I felt bad to ask for so much, but he gave graciously. As we were finally leaving, several members of the congregation came forward to receive pieces of cotton that were torn off, one-by-one, from the larger swabs that were packed into the trough at the base of the icon. These were soaked with myrrh and were placed in small zip-lock bags for members of the congregation to take with them. My mother and sister hesitated at first. However, Father Mark was clearly liberal in the distribution of these bags, and they each ended up with one. My grown sister overheard Father Mark telling a little girl in the congregation to take one with her and teasing the girl by telling her to go and tell her brother that Father Mark said he couldn’t have one today. My wife and I each got a separate bag as well. In 1 Kings 17 and then again in 2 Kings 4, we read of first Elijah and then his disciple Elisha making a jar of oil flow continually in the service of God as well as an old widow who is seeking to care for her destitute family. In a vision from Zechariah 4, we again see an endless supply of oil. In this account, two olive trees provide a continual stream of oil to keep a beautiful lamp stand alight with seven flames (like the lamp in the tabernacle and temple as well as the seven lamps that represent each of the churches written to by Jesus Christ at the beginning of St. John’s Apocalypse). In many of these Biblical references, the oil is connected to the Spirit of God bringing light and life to all His creatures. And there is also another theme, one of anointing with medicines and perfumes. The word “mercy” in English is the translation of the Greek word eleos. This word is based on an older Greek root meaning olive oil, a substance that was used as a soothing agent for bruises and wounds (as we see in the story of the Samaritan who was a good neighbor). This song and this poem both capture a lot, in different ways, about God’s presence as it has been mediated to us all daily, in unexpected ways. After writing all this, however, I am not much closer to making a decision about what to do with my bag of myrrh. My wife and I have shared a few ideas with each other, both immediately afterward and in the following days. Regardless, I am simply grateful to have had its beautiful smell in my home for this week and to be faced with the strange dilemma that it brings. I’ll probably try to share my myrrh somehow (the wise men gave away all of their myrrh after all), and I will also seek ideas from others who are older and wiser than myself. And your suggestions, dear reader, are welcome too. It seems to me, and I am deeply convinced of this, that the Church should never speak from a position of power. It should not be one power among others operating in one state or another; it should be, if you will, just as powerless as God, Who does not use force; Who only beckons us, opening up the beauty and truth of things without imposing them; Who is like our conscience, telling us the truth while leaving us free either to listen to truth and beauty or to reject them. It seems to me that the Church should be precisely like that; if the Church should gain the position of a powerful organization, one with the ability to coerce or direct events, then there will always be the risk that it will want to wield power; but as soon as the Church begins to wield power, it will lose its deepest essence: the love of God and an understanding of those whom it is called to save, not to destroy and remake. From Metropolitan Anthony of Sourozh (Vladyka Anthony) in an interview with M.B. Meilakh in London (which was printed in Literator, an organ of the Leningrad Writers’ Organization, on September 21, 1990).